This will be followed by “Taconic Parkway“, written and directed by Sudipta Bhawmik, starring Indranil Mukherjee, Keka Sirkar and Pinaki Dutta. This play will premiere at the California Natyamela on June 7th. Synopsis of the plays and other details are given below. Seating is limited, hence please book your seats as early as possible. A phone rings in the middle of the night in a middle class Bengali home in suburban America and throws the life of a married couple in complete jeopardy. Manasij, a veteran Bengali screen actor is visiting USA with a theater group to stage some shows in multiple cities. During his first stop in New York, he is hosted by Dipak and Sharika at their multi-million dollar mansion in upstate New York. The enthusiastic host, Dipak, expresses his desire to make a film with Manasij as the hero and their daughter Pom as the heroine. But Sharika objects to this proposal vehemently. She would never let Pom take part in this dream project of Dipak. Manasij tries to mediate, but soon realizes that he is being pulled into a dark vortex of suspicion and animosity that was carefully camouflaged by the opulence and the veneer of apparent happiness of an affluent NRI family. 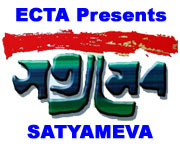 For details about Satyameva click this link. This entry was posted in Arts-Culture, Asides, Events, Generic, Need Help and tagged Bengali, Cleveland, ECTA, Edison, New Jersey, Taconic, theater, USA by sudipta. Bookmark the permalink.